QDC ...has supplied full frame systems for several projects. As it marks 35 years of service to the Saudi construction industry this year, Qanbar Dywidag Precast Concrete Company (QDC) is busy completing key housing and industrial projects in Saudi Arabia and keenly eyeing others that are set to be awarded soon. The veteran Saudi precast concrete manufacturer has built a reputation for its reliability and quality over the past three decades, providing quality precast concrete products at competitive prices and outstanding service to customers in the kingdom. QDC continues to be a leading supplier for the array of housing, industrial and infrastructural projects under way in Saudi Arabia and counts among its clients some of the most reputed names in the kingdom including Saudi Aramco, the Royal Commission of Jubail and Yanbu, Saudi Basic Industries Corporation (Sabic), Saudi Electricity Company (SEC), Ma’aden, and various military and civil government authorities as well as the private sector. 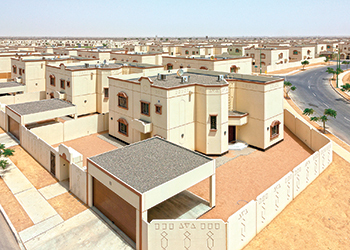 The company is currently working on Saudi Aramco’s Dhahran residential community, packages Four, Five and Seven, for which it is supplying complete full-frame systems under subcontracts from the contractors on the packages, namely China Railway Construction Corporation, Arabtec and Khonaini, respectively. “We are witnessing very good progress on the Dhahran residential community Packages Four and Five and expect to complete our part of the project by the year-end,” says Mohammed Abdullah, QDC sales manager points out. The company is also involved in Saudi Aramco’s residential project at Ras Tanura, supplying wall frame systems for 80 villas to the contractor Khonaini, according to Abdullah. QDC is currently involved in housing projects in Jubail for the Royal Commission where it is supplying total full-frame precast components for housing units (C-71) to Azmeel Contracting, the contractor. “In fact, the Royal Commission has even approached QDC to handle delayed projects it had awarded to other precast companies to meet its target schedule as rush projects,” Abdullah points out. QDC is also involved in a unique development in Thuwal (Northern Province) for Saudi Aramco under a contract valued at SR300 million ($80 million). “This is the National Guard family compound project, which consists of 500 villas that are being built by Azmeel Contracting Company,” says Abdullah. In addition, QDC is also involved in the infrastructure and utilities sector supplying to projects such as the Haramain High-Speed Railway in the Western Province, being carried out by Inabensa Company; and a water transmission project in the Western Province for Saline Water Conversion Corporation (SWCC) being implemented by Sinopec. Having gained a reputation for its quality and reliability, the company is now optimistic of getting a good share of work next year on Sabic’s new Mutrafiah housing project in Jubail, in addition to a share in development projects for Saudi Aramco in Fadhili. Commenting on the current precast business, Abdullah says there has been a noticeable drop in the construction market and this subsequently has affected the precast sector, since precast forms a big share of the market. He cites the example of the Royal Commission of Jubail and Yanbu, which has slowed down or delayed some projects for the time being. QDC was established in 1981 as a partnership between Al Ansari Holding Company (Abdul Razzaq Mohammed Qanbar Al Ansari and Sons), a leading business conglomerate in the Eastern Province, and Dycherhoff and Widmann (Dywidag), one of the largest German general contractors and precast concrete manufacturers. In January 2002, Al Ansari Holding became the sole owner of QDC with Dywidag remaining as a technical partner. Its products are manufactured in three state-of-the-art factories in Jubail and Rabigh, which have a combined production capacity of more than 5 million sq m per year (2 million sq m in Jubail factories and 3 million sq m in the Rabigh factory). These facilities are regularly upgraded to ensure they are able to meet the growing demand as well as add value to the company’s products. The company provides a comprehensive range of products, offering basically a one-stop shop for all precast and prestressed concrete requirements, right from standard precast concrete elements, products such as paving and interlocks tiles, manholes, seating, external cladding panels, hollowcore slabs, double-tee slabs, and precast domes, prestressed long spans girders, wall frame, beams and columns frame and boundary walls. QDC has installed a highly-automated state-of-the-art concrete batching plant at its main factory in Jubail and four additional hollowcore lines at its Rabigh factory. It is also set to launch the construction of a new administration building, mess hall and mosque at the Rabigh factory. Meanwhile, the company recently opened a new sales office in Jeddah and will be expanding its sales staff in Jeddah, as well as in Riyadh, Jubail and Dammam.